Ten Golden Homer Moments to Celebrate Another Two Years! Woohoo! The Simpsons are saved! Whew. Citing disputes with the voice actors’ salary, all was not well at 742 Evergreen Terrace last week. 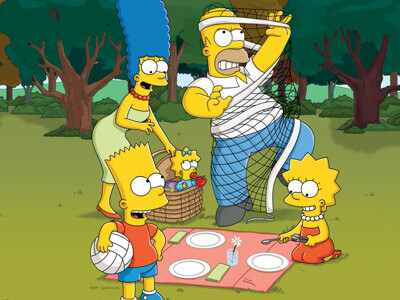 It was reported that The Simpsons, the longest running primetime cartoon was in danger of getting the axe. Obviously, this was not taken lightly; said news flooded twitter and facebook, becoming a trending topic on the former and not letting up on the newsfeed on the latter. But of course: The Simpsons has been providing us with insightful gags and heartwarming moments for over 20 seasons. It has even been proclaimed by Time Magazine as the century’s best television series. In 2010, Entertainment Weekly named Homer "the greatest character of the last 20 years." It was hard not to hear the loud and persistent NO. And so, over the weekend, reports had it that The Simpsons gets another two years. So hooray! We get another two years with them four-fingered yellow character. We’re especially looking at the direction of…Homer, he of the Creatively Brilliant in his Stupidity Fame. He, who’s always been the heart of the series. So to celebrate this win, and in anticipation of another two years of d’oh and duffs, we present you the ten best moments Homeric history! An homage to Michel Gondry’s Eternal Sunshine of the Spotless Mind, this timeline-traveling, mind-bending episode won The Simpsons’ its 10th Emmy award. Watch Homer as his life flashes back in one of the most visually stunning surrealistic scenes in the show’s history. Homer’s goes on an epic spiritual odyssey after eating Springfield’s deadliest chili, the Merciless Pepper of Quetzalazatenango also known as the Guatemalan Insanity Pepper. In his hallucination, Homer ends up in the desert talking to his cosmic coyote spiritual guide voiced by Johnny Cash. The cosmic Cash coyote then advises Homer to find his soulmate, which makes him realize his destiny was with him all along.